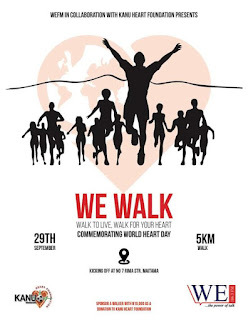 WE FM 106.3 in partnership with Kanu Heart Foundation commemorates the World Heart Day on the 29th of September with a 5km Charity Walk within Maitama tagged "WE WALK". Join this great cause by coming out for the walk which will take place same day, the 29th of September. #7 Rima street, Maitama Abuja at 7am! You can also support the foundation by sponsoring a walker with just N10,000 or more! For Participation and Sponsorship, call 080367898076 or 08062913176.